If making immediately, preheat your oven to 350F. In a small bowl, combine the mayo, horseradish, capers and mustard. Taste and adjust seasonings. Reserve until ready to serve. Remove phyllo from package and place a barely damp towel over it to keep it from drying out. (If the towel is sopping the phyllo will get mushy. And that is no good.). Remove one sheet and lay it out on your work surface. Brush with a thin layer of melted butter, then sprinkle on some parmesan and then pepper. Place another layer on top and repeat with the butter and cheese, until you have 3 layers. Divide the phyllo into 5 equal strips and then down the center so you have 10 rectangles. Position a stalk of the asparagus on the bottom edge of a rectangle and roll it up. Brush the tips and outside with more butter and place on a lined sheet pan, seam side down. When ready, bake until golden brown, approx. 15 minutes. Serve hot with the sauce. 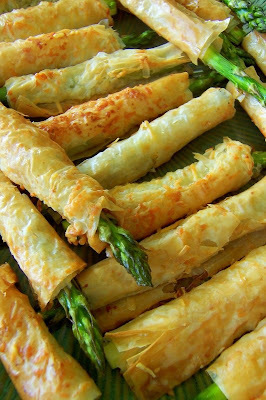 Filo (also spelled phyllo) is very thin sheets of pastry. White asparagus has been grown without letting it emerge from the soil, thus preventing exposure to sunlight, and stopping the color from developing. The smae technique keeps Belgian endive white.